Tuesday afternoon, 6 June – RT Kendall teaches about the gifts of the Spirit. Tuesday noon, 6 June – RT Kendall teaches about Jesus and the Holy Spirit. 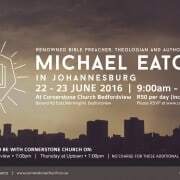 Tuesday morning, 6 June – Michael Eaton speaks on the doctrine of God. Monday evening, 5 June – RT Kendall speaks on the sovereignty of God. This was the fifth session of our time with RT Kendall and Michael Eaton. Michael Eaton continues to expound Psalm 27:4. This was the third session of our time with RT Kendall and Michael Eaton. Monday noon, 5 June 2017. Michael Eaton begins to expound on Psalm 27:4. 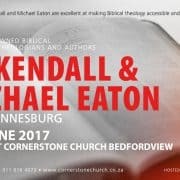 This was the second session of our time with RT Kendall and Michael Eaton. Monday morning, 5 June 2017. RT Kendall talks about the value of studying theology in this first session of our time with RT Kendall and Michael Eaton.